Before getting to the main topic, I have an announcement! One of the challenges of professional science writing is that, unless you get one of the rare paid blogging or columnist gigs, you don’t get many chances to write reflective or creative pieces on the topics that really engage you. So, I’m trying something different: a Patreon. Think of the post below (on jazz musician Thelonious Sphere Monk, math, and creativity) and past blog posts as a free preview of what you’d be paying for if you support me. Please check my Patreon page and this video for more information. Thelonious Sphere Monk was born October 10, 1917: 100 years ago today. He died in 1982 when he was only 64 years old, and had retired from public life several years before that. Despite that too-short life, Monk was one of the foremost jazz composers and pianists, one of the innovators who brought jazz from the big band swing era into modernity. Of course, history is never neat, even recent history. Monk was a modernist without a doubt, but he had one foot firmly anchored in music’s past. As I write this, I’m listening to his great 1965 album Solo Monk, which is a mixture of his own compositions and a number of old-fashioned standard tunes. All of them are indisputably “Monk”, with his trademark dissonant harmonies and angular phrases (more about both of those shortly! ), but also methods he picked up from earlier generations of jazz giants. In an interview with Down Beat magazine not long before his retirement, Monk said, “All musicians are subconsciously mathematicians.” Between that and his middle name “Sphere” (probably a variant of a past family name “Speer”) he endeared himself forever to the mathematically inclined. What he meant by his “mathematicians” quote is something we’ll never know. Monk was notoriously puckish in interviews and to nearly anyone he didn’t know well; he could be uncommunicative especially as age and poorly-treated bipolar disorder affected him. But since I’m free to interpret his words as I choose, I’ll take it to mean something that gets at the heart of creativity within structure. In other words, music when it’s done right is something like math; math — both in and out of science — when it’s done right is something like jazz. When they want to evoke the link between math and music, many writers go back to Bach. The classic example is the Pulitzer-prize winning book Gödel-Escher-Bach by Douglas Hofstadter. It’s easy to see why: the permutations of baroque fugues and canons echo the patterns of number theory, not to mention the quasi-religious fervor involved in contemplating infinities. My background is gravitational theory, which is rooted in geometry. You’re probably familiar with the high school version of geometry: proving theorems about parallel lines and angles and simple shapes. That stuff’s important, but it’s like learning scales on the piano to get ready to play Beethoven. Modern geometry — the stuff of particle physics and general relativity — is a whole level beyond. Think of a sphere, like Monk’s middle name. If you start drawing two parallel lines on the surface of a sphere, they’ll eventually converge and meet: they stop being parallel. That’s because the surface is curved, and how quickly those lines come together depends on exactly how curved. A flat surface, like the ones we spent most of our time on in high school, has no curvature, so parallel lines never come together. Modern geometry lets you describe objects that have curvature that varies from place to place: curvature is “local”. Curvature can even be negative, meaning initially-parallel lines get farther apart. General relativity describes gravity using that local curvature. Where matter is concentrated, like a star or a black hole, the curvature is large, steering the paths of planets, particles, and even light according to the local geometry. But there are still rules governing how geometry works, what’s permissible and what’s not. In jazz, the structure of the music is largely governed by the rhythm and the “changes”: underlying chords or harmonies. Within those structures, jazz and geometry have a lot of freedom. The geometry of general relativity is known as “non-Euclidean”, meaning that it departs from the ancient geometry of Euclid. Even in medieval times, though, mathematicians were pushing geometry beyond Euclid, including the Persian poet-mathematician Omar Khayyam. If swing is Euclidean jazz, Monk and his cohort were the non-Euclidean revolutionaries: the ones who saw the limitations of what came before and used their deep understanding to break just the right rules to make something new. The walking-pace, almost plodding tempo and musical harmonies certainly evoke a train. It’s not one of his better-known tunes: Monk only recorded it twice, unlike a lot of his other compositions, and I’ve never heard another group perform it. “Locomotive” almost fools you into thinking it’s a blues: a very standard form in jazz and rock, based on a 12-measure pattern of three chords (though many blues-derived tunes build off that pattern, adding more chords, or changing to a minor key). But it’s not a blues. Just as non-Euclidean geometry is consistent within itself, Monk’s music has rules — they just aren’t the usual ones established by his predecessors. Monk wasn’t a mystic like his protégé John Coltrane, whose interest in physics and symbolism is a major subject of physicist-musician Stephon Alexander’s book The Jazz of Physics. Coltrane was a string theorist, a grand unifier of jazz; Monk was the essentialist, who heard new forms of harmony and rhythm by rejecting the non-essential axioms of swing, stripping jazz down to its fundamentals to show the next generation how it works. It’s hard for me to pick a favorite Monk tune, but “Bye-ya” (the video linked above) is in my top five. The percussive piano and quasi-Caribbean rhythm make for a fun sound, but it’s doubly interesting for ending the melody in a different key than it starts. Unlike most songs, which loop back to the original chord (or compatible chord at least) when the melody is done, it’s an asymmetrical structure. Not many people could play like Monk, and most wouldn’t want to. Some of the musicians he influenced most don’t play much like him, but that doesn’t mean he isn’t there. 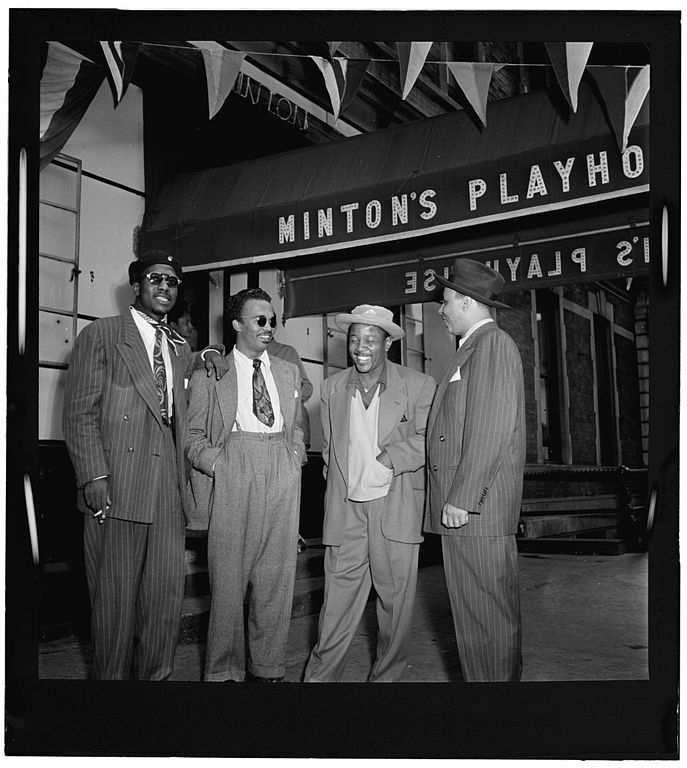 Monk is the second-most performed jazz composer (following Duke Ellington, who was far more prolific, even leaving out tunes his orchestra members wrote and he stole credit for). But of course nobody is just their mental illness, any more than anyone is defined by cancer or other physical conditions. Monk was also a devoted family man, with an extended family consisting of many musicians. He particularly had a soft spot for jobbing musicians in difficult spots, including those with drug problems (which frankly accounted for a lot of them in the 1950s). John Coltrane was one he helped, providing him with a steady gig that helped him eventually get started as a leader of his own groups. Black jazz musicians in the ’50s and their fans were also frequently targeted by cops, who arrested and beat them on flimsy grounds, planting drugs during searches, and hassling them for things like hanging around outside with white people, especially white women. Monk was arrested several times, and deprived of his livelihood through the policy of the “cabaret card” which meant the city arbitrarily controlled who could perform or not. We haven’t come as far as many white people would like to believe. [Physics Nobel laureate] Abdus Salaam once said that when Blacks started to enter physics in large numbers, it would create something like jazz. The problem is that astro/physicists don’t really want jazz. They say they do, but they don’t want to do the work of learning a new way of doing things. They want to keep playing the same classical songs, exactly the same way. Sure maybe they are willing to include new looking people in their band, but only if we play to their beat, their way. Only if we do the work, not them. But I can’t live like that and so many marginalized people can’t live like that. Most (white) physicists may not want jazz, but they/we need it. On Thelonious Sphere Monk’s 100th birthday, it’s good to be reminded that we have to challenge our own assumptions, find what is inessential and discard it, and let the beautiful music out.